As a rule, I've never put much value in whisky scores given by a single whisky reviewer (yes I'm aware of the irony - bear with me). These days some people seem to place far too much emphasis on what one person thinks of a whisky, rather than developing their own opinion. Where such scores are useful is in comparing one dram to another based on the preferences of that reviewer. For example - I love Starward whiskies, I love heavily sherried GlenDronach whiskies, and I also love the delicate yet complex nature of Glenfiddich. If you do too, then you might get some value, or insight from my whisky scores - they might resonate with you, and if I score a whisky, say 94, then there's a chance you might like that whisky a lot too. If my preferences don't resonate with you, then that's fine too - everyone's palate is different, and if you sit in that camp, maybe you shouldn't place so much importance on the scores I give (but feel free to keep reading our reviews anyway)! As well as representing the opinion of only one man (admittedly one with extensive experience), Jim Murray and his preferences have been proven on many occasions to differ to mine. For example, he referred to the (old) Laphroaig 15yo as a "hugely disappointing, lacklustre dram" and "woefully short on complexity". I disagreed. So...when Jim recently voted a ~$30USD Canadian Rye as his world whisky of the year, I was pretty sure I wouldn't consider it my whisky of the year. 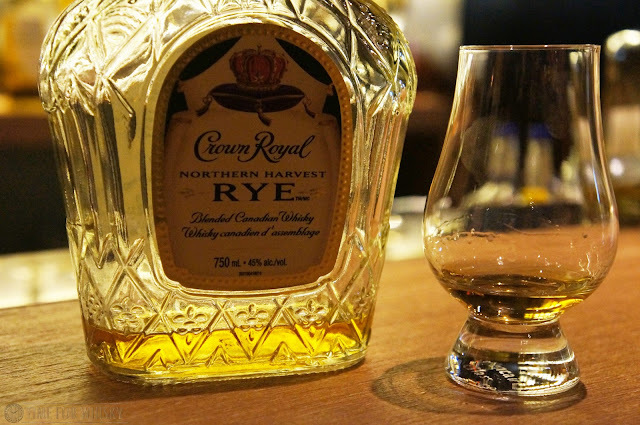 Don't get me wrong, I love a good rye, I just struggled to see how a mass-produced, readily available cheap rye blend could really compete with some of the amazing whiskies we'd tried on this blog over the past 12 months. Nose: Tropical fruit - passionfruit, papaya, and loads of candied ginger. Palate: Ginger - both fresh and candied. Pineapple, passionfruit, lots of floral notes. Slight peppery notes but they're very much in the background rather than the dominant feature. To be fair, there's quite a bit going on here, and it's all enjoyable. Finish: Long, drying and slightly bitter (bitter oranges / orange peel).